As Saint Patrick was deemed the Apostle of Ireland, surely Joe Hurley is the missionary of all things Irish rock 'n' roll in New York City. It's a shame the two never met, as far as I know. For those of you outside the musical circles of the metropolitan area, Mr. Hurley is a bona-fide local legend. A revered composer, singer, band-leader, actor, recording artist, artistic director of Ourland Fest, writer, and voice-over artist, among other titles, Joe Hurley's resume is decidedly astounding. To my ears, Hurley's work at the helm of Rogue's March which also featured J-F Vergel, Ivan Julian, and Adam Roth, among others, stands with the icons of rock prose who set their libretto to the swagger of a whiskey soaked pub band bar none. His collaborations span Ian Hunter, The Chieftains, PJ Harvey, Sam Shepard, Marianne Faithfull, Shane MacGowan, and Jimmy Webb to cite an extremely select few. Hurley, along with Johnny Depp, recently grabbed an Audie Award for the narration of the Keith Richards' memoir Life. There is nary a stage in the Big Apple that Hurley has not traversed with great success, from Lincoln Center to the Central Park Summer Stage, to the dingy, durable dives that define Joe's beloved East Village. His recent ensemble, aptly dubbed Joe Hurley & The Gents includes Patti Smith bassist Tony Shanahan, and guitarist James Mastro of Ian Hunter's Rant Band. The Irish Catholic London-bred bard is also the founder and driving force of another New York City institution- the annual All-Star Irish Rock Review, which traditionally commences around St. Patrick's Day. The Revue was borne of modest beginnings in 1999 ("I didn't want Prince to get all the glory!") 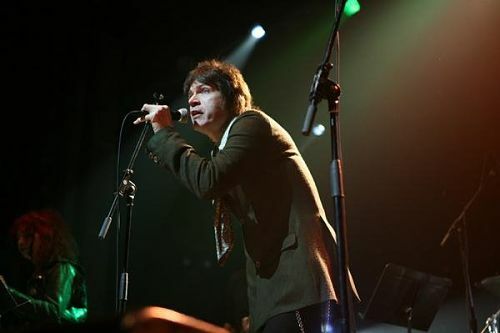 as a platform for Hurley and his multi-cultural cadre of simpatico artists to pay homage to the Irish songbook by rendering a mélange of Celtic compositions along with choice gems from the canon of Morrison, Morrissey, Boomtown Rats, Jim Carroll, Phil Lynott, U2, The Pogues, The Dubliners, and Sinead O'Conner, among many others. Recalls Edward Rogers, another local rocker of renown by way of Birmingham, England who serves as Hurley's co-host and also performs at the Revue, "I remember the early days at the Mercury Lounge. It was a small show by the artists who cared about the music that was dear to them. There is so much great material that came out of Ireland that people are not aware of. A lot of Irish bands were lumped in with the British bands - but the Irish culture is different than the English, they have a much more Celtic heart and soul to their music. Perhaps they had more obstacles to overcome, their country is smaller, and it was harder for Irish artists to get recognition." Rogers is not surprised that the Revue speaks to a wide audience regardless of their heritage, or political disposition. "The songs are universal and they speak to the heart" he waxes, "there's always a little bit of Blarney, but there's also a lot of soul, and there's a little bit of tears too. You don't have to be 'green' to get in!" Hurley concurs. "I think the appeal of the Revue is the sharing of the human condition. Plus, there are so many people in America of Irish descent. America is such a young country, and there's that need to connect with your heritage, your bloodline. When U2 first came out in America it was an enormous source of pride for Irish Americans. The Revue members are not all of Irish descent, just like if you look around the East Village when this thing started. The actors, songwriters, photographers, musicians, singers, fine artists, poets - we're all ethnically across the board, we're as culturally diverse and eclectic as it gets! Which is what the Irish are! And at the Revue, there is no artifice involved in any of the music." National Geographic, not particularly known for rock 'n' roll content, recognized Joe's All-Star Irish Rock Revue as the #2 Star Attraction in their feature "The 10 Best Places to Celebrate the St Pat's Season In America." Says Joe "number one was the Parade in New York City!" Go figure! The roster of past performers, which include Irish ambassadors among other officials, represents a veritable history of New York City's artistic lineage, from Broadway stars to poets, journalists, actors, to indie rockers and permutations thereof. Joe revels in telling stories of unforgettable appearances by Ronnie Spector, Michael Cerveris, Pete Hamill, Colum McCann, Marianne Faithful, and Tony Visconti who, in a recognition of Irish rock icon Phil Lynott, rendered "Cowboy Song" and "The Boys Are Back In Town" at an early Revue in the same manner in which those tracks appeared on Thin Lizzy's Live and Dangerous - the historic double live platter produced by Visconti which inspired scores of rock bands worldwide. Exclaims Joe "and we've kept those two songs in our set the way Tony did them that night! That was a great moment for me." Rather than take up valuable space restating the Revue's storied past, this year's event, which takes place two days following St. Patrick's Day, is impressive, as you would expect. 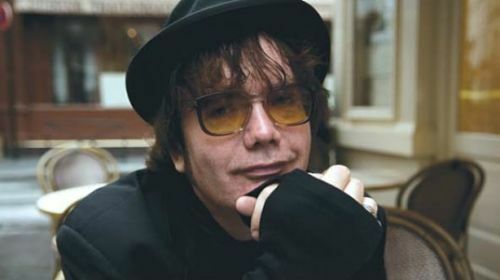 In addition to Hurley and Rogers, the 2016 Revue will feature Willie Nile, Garland Jeffreys, Cait O'Riordan (The Pogues) Laura Cantrell, Mary Lee Kortes, Ellen Foley, Shannon Conley (Lez Zeppelin), Michael Cerveris, Pierce Turner, Carlton J Smith, Alphie McCourt, Sherryl Marshall, Don Fleming, Lianne Smith, Tony Zakowski, Alice June Blythe, Mike Fornatale, Al Landess, Gerard Gerard, Tami Lynn, Tammy Faye and Barry Reynolds, The Kennedys, Sasha Dobson, Tony Shanahan, John Rafferty, Jim Mastro, and Gary Thomas, among others. Hurley notes that there will likely be surprise guest or two who will probably adhere to "the Irish tradition of arriving unannounced at the last minute!" The All-Star Irish Rock Revue Band also boasts New York City's finest accompanists: drummer Steve Goulding (Graham Parker, The Mekons, Elvis Costello), bassist Sal Maida (Roxy Music, The Sparks, Cracker), multi-instrumentalist Jon Spurney (Passing Strange-Stew), vocalists Tish & Snooky, guitarist Chris Flynn (Rogue's March), keyboardist Ken Margolis (The Smithereens, Cracker, Rogue's March), violinist Deni Bonet (REM, Cyndi Lauper), and saxophonist Erik Lawrence (Levon Helm Band), among others. Hurley notes that 2016 marks the fortieth anniversary of the release of Thin Lizzy's Jailbreak, and the thirtieth anniversary of Phil Lynott's passing; two events which will be duly referenced this year. Members of All-Star Irish Rock Revues who have recently departed this mortal coil will also be honored. 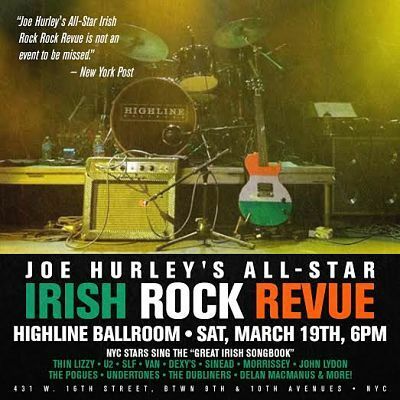 Joe Hurley's All-Star Irish Rock Revue, hosted by Joe Hurley and Edward Rogers commences Saturday, March 19, 2016 at the Highline Ballroom at 6:00 PM.